Abstract submission was closed and notification of acceptance was announced by 5 Aug 2016. Authors of accepted abstract will receive a notification email together with the Guidelines and Templates for full papers. Full paper submission is managed through the ConfTool system, please register and login to the online submission system. Please submit the full paper by 30 Sep 2016. All paper submission should follow the format as per the guidelines. Notification of acceptance/rejection will be announced by 31 Dec 2016. Successful authors will be provided with specific instructions in relation to their presentation time, duration, format, etc. All full papers will undergo a double blind peer review process by the International Scientific Review Panel, who will also decide the acceptance for oral or poster presentation. 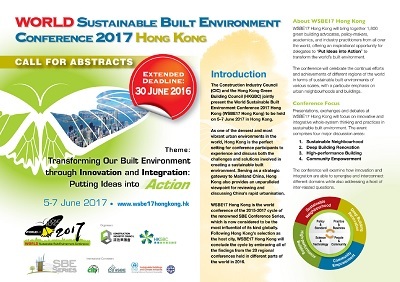 Accepted papers of the World Sustainable Built Environment Conference 2017 Hong Kong (WSBE17 Hong Kong) will gain global exposure and have a chance to get presented to over 1,800 top-notch industry professionals, policy makers and academia at the Conference. Moreover, selected top papers could be published on special issues of renowned international journals such as the Energy and Buildings, Indoor and Built Environment and Building Research & Information! Each presentation of accepted paper shall come with one conference registration. Abstract should be in English with no more than 300 words. The abstract should give reviewers concise information about the content of your paper. All abstract submission should follow the format of the guidelines. Please read the Instruction and Guidelines for Submission. The deadline of abstract submission is 30 Jun 2016. Notification of acceptance/rejection will be issued by 5 Aug 2016. Information for the preparation of full paper will be sent to the authors of accepted abstract together with the notification email. 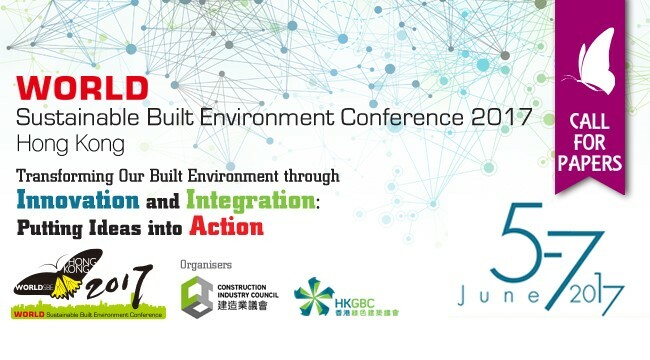 The conference will examine how innovation and integration are able to synergise and interconnect different domains while also addressing a host of inter-related questions. How can our POLICY & STANDARD be more engaging in aligning visions, setting necessary goals and fostering sustainable built environments? How can PRACTICE & BUSINESS, across a broad spectrum of disciplines, be more effective in delivering significantly improved building performance and targeted results? How can SCIENCE & TECHNOLOGY be better developed to enable significantly improved performance? How can PEOPLE & COMMUNITY be better empowered to adopt a more sustainable pattern of living? A wide spectrum of sustainability issues will be covered, such as climate change, the sustainable use of energy, water and material resources, restoration of lost biodiversity, the reduction of waste, pollution, the heat island effect, and so forth.